The rising tide of populism is antithetical to good government. We are teetering on the brink of a climate catastrophe yet we are distracted by a number of surreal political dramas as the window of opportunity to act is closing. Although widespread ecological degradation demands urgent action the influence of populism is eroding environmental protections and diminishing climate action. Those who subscribe to science-based policy decisions have every reason to fear populism. This is a brand of politics commonly premised on xenophobia. It preys on people's darkest fears and panders to tribalism. Populism creates an enemy out of the marginalized and unravels the fabric of the social contract. It enfeebles multilateralism and strikes at the heart of our democracies. America may no longer be the leader of the free world but Donald Trump is the de facto leader of this populist movement. He has started a trade war with his his closest allies while lauding despots. Trump imposed tariffs on its friends under the ridiculous pretext of national security. It is an insane irony that while branding its closest allies as national security threats Trump is inviting Russia to rejoin the G7 and lauding the barbarous regime of North Korea. 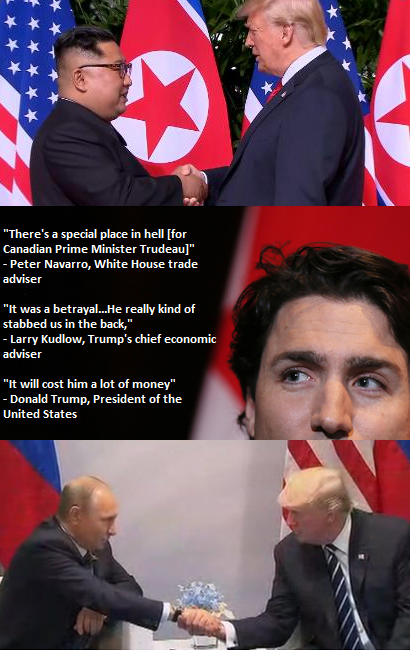 Before and after the G7 meeting in Quebec Trump and members of his administration lambasted America's friends. Trump made a plea to invite Russian thug Vladimir Putin into the G7, he then flew off to Singapore where he claims to have built a "special bond" with North Korean dictator Kim Jong Un. In recent weeks Trump is treating North Korea a lot like he treats Russia. He has lauded Kim without mentioned anything about the flagrant human rights violations committed by one of the world's most tyrannical regimes. At the meeting in Singapore, Trump made major concessions to the man who has killed thousands including his own brother and uncle, without getting anything in return. The two men that Trump seems to admire most are the same two men who have in one way or another threatened America with nuclear weapons. Juxtapose this against the outrage expressed by Trump and his administration towards Canadian Prime Minister Justin Trudeau. All Trudeau did was say that using national security concerns to impose tariffs on aluminum and steel is an insult. For reasons that are entirely unclear a member of the Trump administration said that the Canadian leader "stabbed us in the back" and another added that this is a "betrayal" saying there is a "special place in hell for Trudeau". Trump then followed up by saying that this will cost Canada "a lot of money". All this because the Canadian Prime Minister had the audacity to politely push back against Trump's irrational tariffs. As reported by the Globe and Mail, these tariffs serve nobody except for America's overseas competitors. According to a report from the C.D. Howe Institute, these tariffs could result in the loss of as many as 400,000 American jobs. A forthcoming paper on the study written by economist Dan Ciuriak and Jingliang Xiao says the move will diminish the US GDP. Although America's overseas competition will benefit all three countries in North America will suffer. There are serious real-world consequences to Trump's actions, this absurd drama is a political ruse created by the Trump administration to serve its nativist agenda. This is populism in action. It creates conflicts to achieve political gains. In Trump's case, it is also designed to undermine institutions like the G7. This decades-old institution was created by his predecessors to bring together major democracies with shared values. Now Trump wants Putin, one of the biggest political thugs the world has ever known, to join the club. Perhaps its so that he will not feel so alone. Trump wants to undermine the G7 to derail economic cooperation, multilateralism, and climate action. In 2015 the G7 committed to phasing out fossil fuels, emissions reduction, and climate finance. Populism's irrational ideology gives people a sense of national purpose at a time when globalization is contributing to a widespread sense of alienation. This is helping to grow support for populist parties all around the world. Even centrist governments are feeling the gravitational pull of these populist movements.. The Brexit vote in the UK is only one of many strands of evidence that support this thesis. Even in Canada we recently saw a Trump wannabe by the name of Doug Ford elected as the premiere of Ontario, Canada's wealthiest province. Both Turkey and Poland are currently being led by populist leaders. Last September the populist Alternative of Germany, or AfD ran on an anti-immigration platform to become the first far-right party since World War II to be voted into the German parliament. In March of this year Italy elected two populist parties, the radical-right Lega and the Movimento Cinque Stelle (Five-Stars Movement, or M5S). In April Hungary elected a far-right populist leader Viktor Orban and his Fidesz party. However, election outcomes show that the values of openness and respect for others are far from dead. Last March the Netherlands' anti-immigration far right populist Freedom Party (PVV), failed to win the day and in April France's far-right Front National succumbed to a similar fate. When you combine the two populist parties in Italy they get less than half the vote and in Germany the AFD has the support of only 15 percent of the German population. Liberal values are not dead, not yet anyways, however they are under siege. If men like Trump's former adviser Steve Bannon have any say liberal values will be erased from the face of the earth along with the institutions of democracy. This will end any hope of climate action and erode the edifice of civilization as we know it. The threat posed by the cancer of populism is very serious but it is not impervious, it can be beaten. Populism is inherently weak because it is premised upon mountains of lies. To defeat their lies all we need do is unrelentingly tell the truth.